is a Random House Book for Young Readers — or the young at heart. This was a rollicking read. Julian Twerski is a wonderfully fun character and I loved the time I spent in his neighborhood. While Julian was busy figuring out what it means to be a friend, and what it takes to have friends — and enemies — I relived my own childhood. The story begins when Julian, who was suspended from school for bullying, is instructed to write about the incident. Julian thinks he’s been given a great way to get out of reading Shakespeare, but the assignment, which turns into the diary of his sixth grade year, leads him to look at his friends in ways he had never before considered. Suddenly he’s looking at his best-friend, Lonnie, and seeing someone he isn’t certain he likes. Then a beautiful girl comes along and complicates things even more. I highly recommend this book to readers of all ages, especially adults who have fond memories of their own childhood. 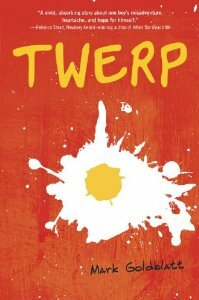 If you enjoy reliving the angst and elation of your formative years, Twerp is definitely the book for you.